Lavrov's comments come as the United Nations tries to keep its fragile Syrian peace talks in Geneva moving forward after a day in which neither the government or opposition delegation held a formal session with U.N. envoy Staffan de Mistura. Russia has come under Western criticism for its air campaign in Syria, saying it focuses on opposition fighters instead of militants, which Russia repeatedly denied. 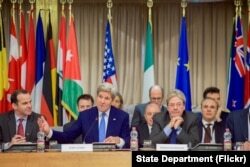 U.S. Secretary of State John Kerry delivers his opening remarks on Feb. 2, 2016, at the Italian Foreign Ministry in Rome, Italy, at the outset of a meeting of the multinational counter-ISIL coalition. But members of the opposition delegation in Geneva said the gesture would make little difference for the peace process. The Syrian government delegation said it did not open formal negotiations as scheduled Tuesday with U.N. envoy Staffan de Mistura, saying the basic framework or agenda of the talks had yet to be established, and the process had not yet moved beyond the preparatory phase. U.N. mediator for Syria Staffan de Mistura gestures during a news conference after a meeting with the Syrian High Negotiations Committee (HNC) during the peace talks at the United Nations in Geneva, Switzerland, Feb. 1, 2016. “We are waiting to find out the procedural issues, who will negotiate. Until now nothing is clear: one or two or three or four delegations? 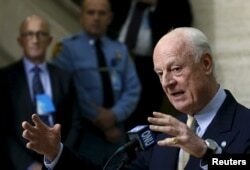 There is no clear answers,” Bashar Jaafari, the chief Syrian government representative, told reporters in Geneva. At the same time, the main opposition group canceled a meeting it had scheduled with de Mistura on Tuesday, saying the escalating assault by Syrian government forces and their Russian allies are reasons not to pursue negotiations. De Mistura declared the talks officially under way on Monday, after persuading the opposition to join the talks. “As far as we are concerned, their arrival to the Palais des Nations and initiating the discussion with us is the official beginning of the Geneva talks,” the U.N. envoy said. The formal start came exactly one week after they were originally scheduled to begin. Talks were delayed by discussions of who should represent the opposition, then by an opposition boycott and the opposition’s demands for an end to airstrikes and a lifting of blockades on rebel-held areas. FILE - U.N. mediator for Syria Staffan de Mistura delivers a statement after the opening of the Syrian peace talks at the United Nations European headquarters in Geneva, Switzerland, Jan. 29, 2016. De Mistura offered those assurances. On Monday, he said discussions to pause the assault are part of a framework that was decided during multinational discussions held in Vienna last year that cleared the way for the talks. “There was a message in the Vienna meetings that when the Geneva talks will actually start, in parallel there should be a beginning of a serious discussion about cease-fire,” de Mistura said. The head of the Syrian government delegation this week called on the opposition to “show good faith and devote to serious discussions.” But both sides continued to accuse each other of lacking goodwill. Prospects for a cease-fire seemed especially uncertain after the Syrian government, with Russia’s assistance, launched a massive offensive against rebel forces this week. Syrian state media say government forces on Tuesday took the village of Hardatneen, north of Aleppo, Syria’s second-largest city. Observers say forces loyal to President Bashar al-Assad have recaptured several other villages near Aleppo over the past two days. The opposition is threatening to walk out of the Geneva talks if the airstrikes do not stop and if the government does not lift the siege they say is preventing humanitarian aid from reaching civilians in rebel-held areas. Chris Hannas in Washington contributed to this report.